The linear particle accelerators (linac) were mainly used before the circular particle accelerator was invented. Linear particle accelerators can not pass a beam of particles many times through the acceleration process because of its shape, therefore, the linear particle accelerator must accelerate the particles completely in their length. At present, the longest linear particle accelerator is the Stanford Linear Accelerator which is 3 km long. If scientists use the Stanford Linear Accelerator, they can not get results which need over 3 km of acceleration, and all detectors must be spaced along the 3 km path. Linear accelerators have an advantage for very high speed electrons because there is no energy lost as there would be when the beam is curved. In 1940, another kind of particle accelerator was developed from the Synchrocyclotron called the Betatron which accelerated electrons (which are also called beta particles) to useful energies. The American physicist Donald Kerst at the University of Illinois, changed the orientation of the magnets used so that the electrons were accelerated by magnetic induction. 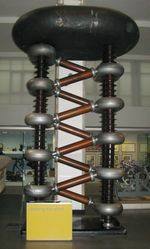 The electrons circulate in a donut shaped vacuum tube and though the cyclotron was unable to accelerate electrons, the betatron could reach energies of 300 mev. High energy electrons can be used to strike a metal target to create high energy x-rays, so betatrons are now sold for medical x-ray machines, and industrial x-rays. The Particle Accelerator is useful for basic science. In nuclear physics, the scientists study nuclear and condensed matter. Condensed matter shows high temperature with high densities, such as in conditions scientists postulate appeared in the Big Bang. Also particle accelerator are used to study the relationship between matter, space, and time. In addition, the particle accelerator is used in medicine. X-ray machines use low energy versions of the accelerator to create the beams of electrons that create the x-rays. Carefully controlled x-ray machines can show clear pictures of our bodies, though emphasizing bones and providing only black and white views. The American physicist Ernest O. Lawrence constructed a cyclotron which can accelerate heavier ions by driving them in a circle, avoiding the extra long tubes needed as the particles grow heavier. Lawrence first made a 4.5 inch diameter cyclotron in January of 1931, and then an 11 inch model by September. He continued to make bigger cyclotrons obtaining research money for nuclear and medical research. In 1940, Donald Kerst built the first betatron at the University of Illinois, in the United States. Larger betatrons were built at levels of 25 MeV, and finally, in 1949, 300 MeV. The USA also tried to make a large particle accelerator, named the Superconducting Super Collider, in Texas. This project’s plan was to develop the greatest particle accelerator with the highest support energy. The planned 87.1 km circumference would have energy support up to 20 TeV (Tera-electronVolts). However, this plan was canceled in 1993 largely due to rising cost estimates. Today, the LHC (Large Hadron Collider) is the largest particle accelerator in the world. It was made by CERN, with a 27 kilometer (17mile) circumference and hopes to reach TeV (Tera-Volt) by colliding beams going in two different directions. However, the LHC was stopped by a superconducting magnet problem in September of 2008,. Since part of the collider was broken, it was shut down until the temperature increased to where people could enter to make repairs. Some magnets short circuited with sufficient arcing to cause soot damage in other components, so all components had to be checked. As of June, 2009, it was hoped that the LHC could restart in the fall of 2009 (nearly a year after the magnet failure). In March of 2010, the LHC was planned to begin functioning at the 3.5 TeV level, which is only half of its planned energy. During the repair phase, 250 magnets were repaired or replaced, and new protective sensors were added which will hopefully prevent any new catastrophic magnet failures. Problems were found in copper bus bars which make it wise to limit power until repairs can be made in the planned shutdown starting in 2012. Full power twin beams of 7 TeV each can only be used after these repairs, probably starting in 2013. The half power level is still higher than any other accelerator, though the Fermilab Tevatron will continue to operate until the LHC is confirmed at the very high power levels. 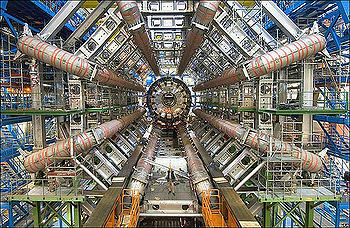 ↑ Powerful Collider Set to Smash Protons, by Ron Cowen, Science News Web addition, accessed 15 Feb 2010. Early Particle AcceleratorThe Center for History of Physics of the American Institute of Physics. Transformer malfunction shuts down LHC unknown author, Current News. This page was last modified on 29 September 2014, at 17:15.